For other uses, see Air France (disambiguation). Air France (French pronunciation: ​[ɛːʁ fʁɑ̃s]; formally Société Air France, S.A.), stylized as AIRFRANCE, is the French flag carrier headquartered in Tremblay-en-France. It is a subsidiary of the Air France–KLM Group and a founding member of the SkyTeam global airline alliance. As of 2013 Air France serves 36 destinations in France and operates worldwide scheduled passenger and cargo services to 168 destinations in 78 countries (93 including overseas departments and territories of France) and also carried 46,803,000 passengers in 2015. The airline's global hub is at Charles de Gaulle Airport with Orly Airport as the primary domestic hub. Air France's corporate headquarters, previously in Montparnasse, Paris, are located on the grounds of Charles de Gaulle Airport, north of Paris. Between April 2001 and March 2002, the airline carried 43.3 million passengers and had a total revenue of €12.53bn. In November 2004, Air France ranked as the largest European airline with 25.5% total market share, and was the largest airline in the world in terms of operating revenue. On 25 July 2000, a Concorde that Air France owned crashed on a hotel in Gonesse. Air France operates a mixed fleet of Airbus and Boeing widebody jets on long-haul routes, and uses Airbus A320 family aircraft on short-haul routes. Air France introduced the A380 on 20 November 2009 with service to New York City's JFK Airport from Paris' Charles de Gaulle Airport. The carrier's regional airline subsidiary, HOP!, operates the majority of its regional domestic and European scheduled services with a fleet of regional jet aircraft. In 1936, Air France added French-built twin engine Potez 62 aircraft to its fleet featuring a two compartment cabin that could accommodate 14 to 16 passengers. A high wing monoplane, it had a wooden fuselage with composite coating while the wings were fabric covered with a metal leading edge. Equipped with Hispano-Suiza V-engines, they were used on routes in Europe, South America and the Far East. Although cruising at only 175 miles per hour, the Potez 62 was a robust and reliable workhorse for Air France and remained in service until the Second World War with one used by the Free French Air Force. On 26 June 1945 all of France's air transport companies were nationalised. On 29 December 1945, a decree of the French Government granted Air France the management of the entire French air transport network. Air France appointed its first flight attendants in 1946. The same year the airline opened its first air terminal at Les Invalides in central Paris. It was linked to Paris Le Bourget Airport, Air France's first operations and engineering base, by coach. At that time the network covered 160,000 km, claimed to be the longest in the world. Société Nationale Air France was set up on 1 January 1946. European schedules were initially operated by a fleet of Douglas DC-3 aircraft. On 1 July 1946, Air France started direct flights between Paris and New York via refuelling stops at Shannon and Gander. Douglas DC-4 piston-engine airliners covered the route in just under 20 hours. In September 1947 Air France's network stretched east from New York, Fort de France and Buenos Aires to Shanghai. By 1948 Air France operated 130 aircraft, one of the largest fleets in the world. Between 1947 and 1965 the airline operated Lockheed Constellations on passenger and cargo services worldwide. 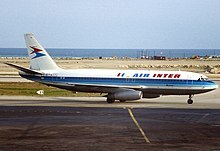 In 1946 and 1948, respectively, the French government authorised the creation of two private airlines: Transports Aériens Internationaux – later Transports Aériens Intercontinentaux – (TAI) and SATI. In 1949 the latter became part of Union Aéromaritime de Transport (UAT), a private French international airline. Compagnie Nationale Air France was created by act of parliament on 16 June 1948. Initially, the government held 70%. In subsequent years the French state's direct and indirect shareholdings reached almost 100%. In mid-2002 the state held 54%. On 4 August 1948 Max Hymans was appointed the president. During his 13-year tenure he would implement modernisation practices centred on the introduction of jet aircraft. In 1949 the company became a co-founder of Société Internationale de Télécommunications Aéronautiques (SITA), an airline telecommunications services company. In 1952 Air France moved its operations and engineering base to the new Paris Orly Airport South terminal. By then the network covered 250,000 km. Air France entered the jet age in 1953 with the original, short-lived de Havilland Comet series 1, the world's first jetliner. During the mid-1950s it also operated the Vickers Viscount turboprop, with twelve entering services between May 1953 and August 1954 on the European routes. On 26 September1953z the government instructed Air France to share long-distance routes with new private airlines. This was followed by the Ministry of Public Works and Transport's imposition of an accord on Air France, Aigle Azur, TAI and UAT, under which some routes to Africa, Asia and the Pacific region were transferred to private carriers. On 23 February 1960, the Ministry of Public Works and Transport transferred Air France's domestic monopoly to Air Inter. To compensate for the loss of its domestic network Air France was given a stake in Air Inter. The following day Air France was instructed to share African routes with Air Afrique and UAT. The airline started uninterrupted jet operations in 1960 with the Sud Aviation Caravelle and the Boeing 707; jet airliners cut travel times in half and improved comfort. Air France later became an early Boeing 747 operator and eventually had one of the world's largest 747 fleets. On 1 February 1963 the government formalised division of routes between Air France and its private sector rivals. 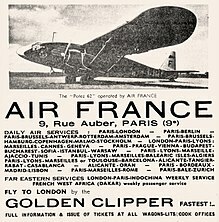 Air France was to withdraw services to West Africa (except Senegal), Central Africa (except Burundi and Rwanda), Southern Africa (including South Africa), Libya in North Africa, Bahrain and Oman in the Middle East, Sri Lanka (then known as Ceylon) in South Asia, Indonesia, Malaysia and Singapore in Southeast Asia, Australia, New Zealand as well as New Caledonia and Tahiti. These routes were allocated to the new Union de Transports Aériens (UTA), a new private airline resulting from the merger of TAI and UAT. UTA also got exclusive rights between Japan, New Caledonia and New Zealand, South Africa and Réunion island in the Indian Ocean, as well as Los Angeles and Tahiti. From 1974, Air France began shifting the bulk of operations to the new Charles de Gaulle Airport north of Paris. By the early 1980s, only Corsica, Martinique, Guadeloupe, most services to French Guiana, Réunion, the Maghreb region, Eastern Europe (except the USSR), Southern Europe (except Greece and Italy), and one daily service to New York (JFK) remained at Orly. In 1974, Air France also became the world's first operator of the Airbus A300 twin-engine widebody plane, Airbus Industrie's first commercial airliner for which it was a launch customer. On 21 January 1976, Air France operated its inaugural supersonic transport (SST) service on the Paris (Charles de Gaulle) to Rio (via Dakar) route with Anglo-French BAC-Aérospatiale Concorde F-BVFA. Supersonic services from Paris (CDG) to Washington Dulles International Airport began on 24 May 1976, also with F-BVFA. Service to New York (JFK) – the only remaining Concorde service until its end – commenced on 22 November 1977. Paris to New York was flown in 3 hours 23 minutes, at about twice the speed of sound. Approval for flights to the United States was initially withheld due to noise protests. Eventually, services to Mexico City via Washington, D.C. were started. Air France became one of only two airlines – British Airways being the other – to regularly operate supersonic services, and continued daily transatlantic Concorde service until late May 2003. By 1983, Air France's golden jubilee, the workforce numbered more than 34,000, its fleet about 100 jet aircraft (including 33 Boeing 747s) and its 634,400 km network served 150 destinations in 73 countries. This made Air France the fourth-largest scheduled passenger airline in the world, as well as the second-largest scheduled freight carrier. Air France also codeshared with regional French airlines, TAT being the most prominent. TAT would later operate several regional international routes on behalf of Air France. In 1983 Air France began passenger flights to South Korea, being the first European airline to do so. In 1986 the government relaxed its policy of dividing traffic rights for scheduled services between Air France, Air Inter and UTA, without route overlaps between them. The decision opened some of Air France's most lucrative routes on which it had enjoyed a government-sanctioned monopoly since 1963 and which were within its exclusive sphere of influence, to rival airlines, notably UTA. The changes enabled UTA to launch scheduled services to new destinations within Air France's sphere, in competition with that airline. Air France operated 33 Boeing 747s by 1983. Here, a 747-100 is seen at CDG Airport in 1978. Paris-San Francisco became the first route UTA served in competition with Air France non-stop from Paris. Air France responded by extending some non-stop Paris-Los Angeles services to Papeete, Tahiti, which competed with UTA on Los Angeles-Papeete. UTA's ability to secure traffic rights outside its traditional sphere in competition with Air France was the result of a campaign to lobby the government to enable it to grow faster, becoming more dynamic and more profitable. This infuriated Air France. In 1987 Air France together with Lufthansa, Iberia and SAS founded Amadeus, an IT company (also known as a GDS) that would enable travel agencies to sell the founders and other airlines' products from a single system. In 1988, Air France was a launch customer for the fly-by-wire (FBW) A320 narrowbody twin, along with Air Inter and British Caledonian. It became the first airline to take delivery of the A320 in March 1988, and along with Air Inter became the first airlines to introduce Airbus A320 service on short-haul routes. On 12 January 1990, the operations of government-owned Air France, semi-public Air Inter and wholly private Union de Transports Aériens (UTA) were merged into an enlarged Air France. Air France's acquisition of UTA and Air Inter was part of an early 1990s government plan to create a unified, national air carrier with the economies of scale and global reach to counter potential threats from the liberalisation of the EU's internal air transport market. In 1997, Air France Europe was absorbed into Air France. On 19 February 1999, French Prime Minister Lionel Jospin's Plural Left government approved Air France's partial privatisation. Its shares were listed on the Paris stock exchange on 22 February 1999. In June 1999, Air France and Delta Air Lines formed a bilateral transatlantic partnership. On 22 June 2000, this expanded into the SkyTeam global airline alliance. On 30 September 2003, Air France and Netherlands-based KLM Royal Dutch Airlines announced the merger of the two airlines, the new company to be known as Air France-KLM. The merger became reality on 5 May 2004. At that point former Air France shareholders owned 81% of the new firm (44% owned by the French state, 37% by private shareholders), former KLM shareholders the rest. The decision of the Jean-Pierre Raffarin government to reduce the French state's shareholding in the former Air France group from 54.4% to 44% of the newly created Air France-KLM Group effectively privatised the new airline. In December 2004 the state sold 18.4% of its equity in Air France-KLM. The state's shareholding in Air France-KLM subsequently fell to just under 20%. Air France-KLM became the largest airline in the world in terms of operating revenues, and third-largest (largest in Europe) in passenger kilometres. Although owned by a single company, Air France and KLM continued to fly under their own brand names. 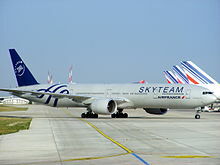 Air France-KLM remained part of the SkyTeam alliance, which then included Aeroflot, Delta Air Lines, Aeroméxico, Korean Air, Czech Airlines, Alitalia, Northwest Airlines, China Southern Airlines, Air Europa, Continental Airlines, Garuda Indonesia, Vietnam Airlines and Saudi Arabian Airlines. As of March 2004, Air France employed 71,654 people. As of March 2007, the airline employed 102,422 personnel. On 17 October 2007, the creation of a profit and revenue-sharing transatlantic joint venture between Air France-KLM and Delta Air Lines was announced during a press conference at Air France-KLM's headquarters. The venture became effective on 29 March 2008. It aimed to exploit transatlantic opportunities to capture a major share of long-haul business traffic from London Heathrow Airport, which opened to unrestricted competition on that day as a result of the "Open Skies" pact between the EU and US. It was envisaged that Air France and Delta would begin nine daily round trips between London-Heathrow and destinations in the US, including a daily London (Heathrow) to Los Angeles service by Air France. Once the new Air France-Delta venture received antitrust immunity, it was to be extended to the other two transatlantic SkyTeam partners, enabling all four partners to codeshare flights as well as to share revenue and profit. The new transatlantic joint venture marks the Air France-KLM Group's second major expansion in the London market, following the launch of CityJet-operated short-haul services from London City Airport that have been aimed at business travellers in the City's financial services industry. However, the daily London (Heathrow) to Los Angeles service was not as successful as hoped, and was discontinued in November 2008. On 12 January 2012, Air France-KLM announced a three-year transformation plan, called Transform 2015, to restore profitability. The plan was to restore competitiveness through cost-cutting, restructuring the short- and medium-haul operations and rapidly reducing debt. The main objective of this plan was to turn Air France-KLM back into a world player by 2015. Air France had been losing 700 million euros a year. As the financial results of 2011 demonstrated, the long-haul operations, also subject to increasing competition, would not be able to offset these losses. On 22 February 2012, Air France released its plan for the summer schedule. Because of the uncertain economic environment, Air France-KLM set a limit of 1.4% maximum increase in capacity from 25 March 2012 – 28 October 2012. On 21 June 2012, Air France-KLM had announced its decision to cut just under 10% of the total 53,000 workforce (about 5,000 jobs) by the end of 2013 in an attempt to restore profitability. The airline expected to lose 1,700 jobs through natural turnover and the rest by voluntary redundancies. As of August 2012, the Transform 2015 plan was accepted by ground staff and pilot unions but rejected by cabin crew unions. At the beginning of July 2012, it was announced that Air France-KLM found partners for the new African start-up airline Air france, which was co-founded by six countries in Central Africa to replace the former Air Afrique. But several problems and two partners, who decided to back out, delayed the implementation of the project. Following its launch, Air france announced it would commence operations in 2013. In September 2013, Air France introduced a brand new Economy product along with an improved Premium Economy seat and service. It is expected that the new improvements would be fitted on aircraft from June 2014 onwards. In October 2013, Air France-KLM announced it was writing off the 25% stake in Alitalia, as it was hesitant the struggling carrier would obtain the 300 million euros in financing. The group has denied Alitalia of additional funds as it is currently struggling to restructure itself to profitability with the Transform 2015 plan. In December 2013, Air France announced that Cityjet no longer meets the short haul needs of the group and is in the process of closing a deal with German firm Intro Aviation by the end of Q1 of 2014. In 2014, the airline was targeted by a negative publicity campaign, spearheaded by PETA, for being the only major airline that permits the transport of primates for research. On 4 February 2014, the new business product was unveiled, featuring a fully flat bed from Zodiac Aerospace. The seat was fitted on Boeing 777 aircraft from June 2014 onwards. In September 2014, Air France announced it would sell a 3 percent stake in travel technology company Amadeus IT Group for $438 million. Late in 2015, Air France faced a financial crisis, which was exacerbated by a pilot's strike against the airline. The airline answered the strike by announcing it would cut some 2,900 jobs. In December 2015, Air France announced the retirement of its last Boeing 747-400 with a special scenic flight on 14 January 2016. The airline operated the 747 in several variants since 1970. In January 2017, Air France received its first Boeing 787-9. In November 2017, CityJet no longer operated on Air France flights and the affected destinations were served by Air France and HOP! from then on. In July 2017, Air France-KLM entered into a multi-airline strategic partnership with Delta Air Lines, China Eastern Airlines and Virgin Atlantic Airways, solidifying the existing ties between the carriers. Under the agreement Delta and China Eastern would each buy 10% of Air France-KLM, while Air France-KLM would buy 31% of Virgin Atlantic. Air France announced it would terminate services to Iran from September 2018, explaining the concern that the route to Iran is no longer commercially viable due to the redefined US sanctions. Air France's head office is located in the Roissypôle complex on the grounds of Charles de Gaulle Airport and in the commune of Tremblay-en-France, Seine-Saint-Denis, near the city of Paris. Wil S. Hylton of The New York Times described the facility as "a huge white box that squats near the runways at Charles de Gaulle Airport." The 130,000 square metres (1,400,000 sq ft) complex was completed in December 1995. The French firm Groupement d'Etudes et de Méthodes d'Ordonnancement (GEMO) managed the project. The architect was Valode & Pistre and the design consultants were Sechaud-Boyssut and Trouvin. The project cost 137,000,000 euros (less than 700 million francs). The runways of the airport are visible from the building. The Air France Operations Control Centre (OCC, French: Centre de Contrôle des Opérations, CCO), which coordinates Air France flights worldwide, is situated at the AF head office. 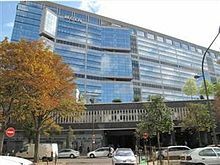 For about 30 years prior to December 1995, Air France's headquarters were located in a tower adjacent to the Gare Montparnasse rail station in the Montparnasse area and the 15th arrondissement of Paris. By 1991 two bids for the purchase of the Square Max Hymans building had been made. By 1992 the complex was sold to Mutuelle générale de l'Éducation nationale [fr] (MGEN) for 1.6 billion francs. By that year Air France had planned to move its head office to Roissypôle, taking 50,000 square metres (540,000 sq ft) of space inside the hotel, office, and shopping complex on the grounds of Charles de Gaulle Airport. After Air France moved to Tremblay-en-France, the ownership of the former head office complex was transferred. On a previous occasion the head office was at 2 rue marbeuf in the 8th arrondissement of Paris. Air France's United States offices are in the 125 West 55th Street building in Midtown Manhattan, New York City. Air France first signed a lease to occupy the building in 1991. The site also formerly housed the New York City city ticket office for Air France. Air France-KLM's head office for the United Kingdom and Ireland operations, which includes facilities for Air France and KLM, is located in Plesman House in Hatton Cross. The facility's inauguration was on 6 July 2006. Air France moved the office from Hounslow to Hatton. Air France Cité PN, located at Charles de Gaulle Airport, acts as the airline's crew base. The building, developed by Valode & Pistre, opened in February 2006. The first phase consisted of 33,400 square metres (360,000 sq ft) of space and 4,300 parking spaces. The building is connected to the Air France head office. Air France operates the Air France Vaccinations Centre in the 7th arrondissement of Paris. The centre distributes vaccines for international travel. Since 2001 the centre was the only French vaccination centre certified International Organization for Standardization (ISO) 9001. In 2005 the centre moved from the Aérogare des Invalides to its current location. The Aérogare des Invalides in the 7th arrondissement of Paris houses the Agence Air France Invalides and the Air France Museum. Until 2005 the building hosted the Air France Vaccinations Centre. On 28 August 1959 Air France opened a ticket and information agency in the former air terminal in Invalides, targeting transit passengers and customers from offices and companies in the Invalides area. Air France regional jet operated by Brit Air, now HOP! Air France and Dutch affiliate Transavia formed Transavia France, a low-cost joint venture in May 2007, based at Orly Airport.Air Corsica, CityJet and HOP! all operate flights on behalf of Air France, either as subsidiaries or as franchisees. As of January 2019, Air France was investigating how it could shut down its low-cost subsidiary Joon and absorb its employees and aircraft into the parent company. Owing to the disputed status of Taiwan, Air France could not operate flights to the island under its own name. In 1993, its subsidiary, Air Charter, began operating flights between Paris and Taipei via Hong Kong, but after Air Charter ceased operations in 1998, a subsidiary called Air France Asie was established. The airline was one of a number of airline subsidiaries flying under the "Asia" name with the purpose of flying to Taiwan, which included Japan Asia Airways (a Japan Airlines subsidiary), KLM Asia, British Asia Airways, Swissair Asia, and Australia Asia Airlines (a Qantas subsidiary). The livery of Air France Asie differed from that of Air France by having blue and white stripes on the tailfin, rather than blue, white and red ones, representing the French Tricolour. Air France Asie used two Airbus A340-200 aircraft, F-GLZD and F-GLZE, and two Boeing 747-428Ms, F-GISA and F-GISC. Similarly, Air France Cargo Asie used a 747-200 Combi (for passengers and freight), F-GCBH) or the all-cargo (F-GCBL, F-GPAN and F-GBOX). Air France Asie ceased operations in 2004 while Air France Cargo Asie ceased operations in 2007. In 2010 Air France migrated from an internally managed Passenger service system (Alpha3) that manages reservation, inventory and pricing to an external system (Altéa) managed by Amadeus. In rail ventures, Air France and Veolia are looking into jointly operating high-speed rail services in Europe. Routes have become available to operators in accordance with European rail liberalisation on 1 January 2010. Air France Boeing 777-300ER in the new livery landing at Montreal-Trudeau. Air France's present livery is a "Eurowhite" scheme, comprising a white fuselage with the blue Air France title and design. The tail is white with a series of parallel red and blue lines across the it at an angle, and a small European flag at the top. This livery has been in use since the late 1970s. Prior to the "Eurowhite" livery, Air France aircraft had a bare-metal underside, extending up to a blue cheat-line that ran across the cabin windows. Above the cheat-line the fuselage was again white, with Air France titles and a French flag. The tail was white with two thick blue lines, which tapered from the rear of the tail and met at point towards the front bottom. This basic livery, with minor variations, would appear on all post-war Air France aircraft until the late 1970s. On January 2009, to coincide with Air France's new logo, a new livery was unveiled. Air France rolled out its new livery on 11 February 2009. The 2009 livery saw the tail slightly changed; there are now 3 blue bars running down instead of 4 previously. The bars also now curve at the bottom, reflecting the design of the logo. The new official song played before and after Air France flights (during boarding and after landing) is 'The World Can Be Yours' by Telepopmusik. Air France has used different popular music groups for its marketing and on-board ambience, ranging from The Chemical Brothers in 1999 to Telepopmusik in 2010. Air France launched a new ad campaign in 2015 designed by BETC and directed by We Are From LA, focusing on French culture. Along with the ad campaign and print ads, Air France also introduced a similarly themed safety video. The music is a customised version of Glass Candy's song Warm in the Winter. Air France uniforms denote the ranks for the flight attendants. Two silver sleeve stripes denote a Chief Purser. One silver sleeve stripe denote a Purser. Flight attendants do not have any sleeve stripes. The female cabin crew uniforms feature the stripes on the breast pocket rather than the sleeve for their male counterparts. Air France's current uniforms were created by French fashion designer Christian Lacroix. Upon its formation, Air France adopted the seahorse logo of its predecessor Air Orient, known as the hippocampe ailé (sometimes derisively called "la crevette" – or shrimp – by its employees), as its insignia. Prior to the Air France-KLM merger, the hippocampe ailé was used on the nose section of aircraft next to the Groupe Air France title; after the merger, the Air France-KLM logo was substituted at the nose area, and the hippocampe ailé was relocated to engine nacelles. The acronym "AF" has also featured prominently on the airline's flag and its signage. On 7 January 2009, Air France officially changed its logo to a red stripe. As of 2011, Air France flies to 36 domestic destinations and 168 international destinations in 93 countries (including Overseas departments and territories of France) across 6 continents. This includes Air France Cargo services and destinations served by franchisees Air Corsica, CityJet and HOP!. Most of Air France's international flights operate from Paris-Charles de Gaulle. Air France also has a strong presence at Paris-Orly, Lyon-Saint-Exupéry, Marseilles Provence, Toulouse Blagnac, Nice Côte d'Azur and Bordeaux-Merignac airports. Charles de Gaulle Airport: Air France's intercontinental and biggest hub, with 335 daily departures. It is also a hub for Air France's subsidiary HOP!. Orly Airport: Air France's second biggest hub serving 40 destinations around the world, it is also a hub for Air France's subsidiary HOP!. Long-haul flights are mainly operated to destinations in French overseas departments. Lyon-Saint Exupéry Airport: Air France's third biggest hub serving 37 destinations in France and Europe, also a hub for Air France's subsidiary HOP!. Marseille Provence Airport: This is Air France's newest hub as part of its offensive in the French regions. It serves 30 destinations in France, Europe and Africa. Nice Côte d'Azur Airport: Air France flies to four destinations from Nice. Toulouse-Blagnac Airport: Air France flies to 14 destinations from Toulouse. Eight aircraft to re-transfer from Joon by the end of 2019. Airbus A321-100 5 — — — — 212 212 Former Air Inter fleet. Five aircraft to re-transfer from Joon by the end of 2019. Airbus A330-200 15 — — 40 21 147 208 To be reconfigured with 224-seat configuration by 2020. Airbus A350-900 — 21 — 34 24 266 324 Entering service in 2019. 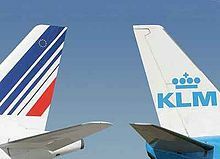 On 16 September 2011, Air France-KLM announced orders for 50 Airbus A350s and Boeing 787s with 60 options, to be operated by both Air France and KLM. The first Boeing 787-9 entered into service with KLM in 2015 and with Air France in early 2017. Air France signed as a launch customer for the Airbus A380-800 "superjumbo" in 2001. Air France had ordered 12 Airbus A380-800 aircraft, with options on a further two. Air France was the first airline in Europe to operate the A380. The first A380 was delivered on 30 October 2009, and the Paris to New York route was used as the first route. All of Air France's Airbus A380s depart from the airline's international hub at Charles de Gaulle Airport in Terminal 2E (Main Terminal, Satellites 3 and 4). In 2018, the Chairman and CEO of Air France-KLM, Benjamin Smith announced the airline would retire 50% of the Airbus A380 fleet by 2021 due to expensive costs, poor efficiency, and in favor of adding more Airbus A350-900s and Boeing 787 Dreamliners to the fleet. Air France is only retiring the five aircraft that were leased to the airline by not renewing their leases and instead returning them to directly to Airbus. The five Airbus A380 aircraft bought by Air France will continue service from 2020 onwards with renewed cabins. Air France-KLM has a commitment for 37 Boeing 787s, 25 directly and 12 leased, of which 16 are earmarked for Air France to replace some A340-300s. Subsequent A340s would be replaced by Airbus A350s from 2019; Air France-KLM has 28 A350s on firm order. As of 2018 Air France had not decided how its narrowbody fleet should be replaced: it operates 117 Airbus A320 family aircraft. Converted from two 747-200M aircraft. Airbus A330-200 Inherited from Union des Transports Aériens. Two aircraft were sold to Mahan Air after retirement. Boeing 747-300M 1 1991 2007 Boeing 747-400 Sold to Mahan Air after retirement. Boeing 747-400BCF 4 2009 2011 Boeing 777F Converted from 747-400 passenger aircraft. The five Air France Concordes were retired on 31 May 2003, as a result of insufficient demand following the 25 July 2000 crash of AF Concorde F-BTSC, at Gonesse (near Charles de Gaulle Airport), as well as higher fuel and maintenance costs. British Airways flew its last Concorde service on 24 October 2003. Concorde F-BVFA was transferred to the Steven F. Udvar-Hazy Center at Washington Dulles International Airport. F-BVFB was given to the Sinsheim Auto & Technik Museum in Germany, F-BTSD to the Musée de l'Air et de l'Espace at Le Bourget Airport in Paris, while F-BVFC returned to its place of manufacture in Toulouse, at the Airbus factory. F-BVFF is the only example to remain at Charles de Gaulle Airport. The airline started operating the 747 on 3 June 1970, when a 747-100 was put into service that was delivered 20 March that year. It would go on to operate the -200, -300 and -400 variants. In January 2016, Air France finally retired its last Boeing 747-400. They were replaced by Airbus A380s and Boeing 777-300ERs. Freighter versions were replaced by Boeing 777Fs. Air France offers a mix of three and four cabin configurations for international long haul routes, featuring La Première (select aircraft), Business, Premium Economy and Economy. Personal screens with audio video on demand is available in all cabins on all long-haul aircraft. European short-haul and medium-haul flights feature a three cabin configuration with Business, Premium Economy, and Economy. La Première, Air France's long-haul first class product, is available on the Airbus A380-800 and selected Boeing 777-300ER aircraft. The Première cabin features wood and leather seats which recline 180°, forming two-metre long beds. Each seat features a 10.4" touchscreen personal screen with interactive gaming and audio video on demand, a privacy divider, automassage feature, reading light, storage drawer, noise-cancelling headphones, personal telephone, and laptop power ports. Each passenger is also provided with a personalised coat service, pure merino wool blanket, a "boudoir-style" cushion, and a travel kit featuring Biologique Recherche facial and body care products to moisturize and refresh the skin. Turndown service includes a mattress, a duvet, hypoallergenic feather pillow, sleepwear, a dust bag for shoes, and a pair of slippers À la carte on-demand meal services feature entrées created by Chef Guy Martin. Private lounge access is offered worldwide featuring a chauffeured car to the aircraft. La Première is not available on the Airbus A330-200, Airbus A340-300, Boeing 777-200ER and selected Boeing 777-300ER aircraft where Business is the highest cabin class. 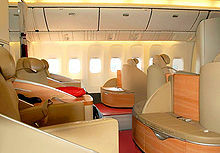 Four-class 777-200ER and 777-300ER configurations are equipped with four and eight La Première seats respectively, while the Airbus A380 feature 9 La Première seats. Business, Air France's long-haul business class product, is available on all long haul aircraft. Business features angled lie-flat seats which recline to two metres in length. Each seat includes a 10.4" touchscreen TV monitor with interactive gaming and AVOD, reading light, personal telephone, and laptop power ports. Meal service features three-course meals and a cheese service, or an express menu served shortly after takeoff. Air France has released a brand new business class product, the seat is a Zodiac Aerospace Cirrus and is designed by Mark Collins of Design Investment, specialized in the world of high-end transportation and by the design and branding agency, Brandimage. The new seat would be installed on the Boeing 777 aircraft from June 2014 until summer 2016, all other aircraft types would then be retrofitted except for the Boeing 747-400 and Airbus A340-300 as they were to be retired from the fleet by 2016 and 2019 respectively. A total of 2,102 seats would be installed. The new cabin features a 1-2-1 layout as opposed to the 2-3-2 layout found currently on the 777. The new 16-inch (41 cm) screen offers a unique onboard navigation experience similar to a tablet. With a completely redesigned user interface and available in 12 languages (French, English, Spanish, Brazilian Portuguese, Chinese, Japanese, Korean, German, Italian, Dutch, Russian and Arabic), choosing an entertainment program from over 1,000 hours of entertainment. The seat converts into a fully flat bed with 180 degrees recline, it features a touchscreen remote control, USB port, universal electrical outlet, new noise cancelling headphones, privacy screen, an Air France signature padded headboard, ample storage space, adjustable headrest, and a duvet with XXL feather down pillow. Premium Economy, is Air France's premium economy product for long haul flights, which became available on the Boeing 777-200ER, 777-300ER, Airbus A340-300 and Airbus A330-200 in late 2009 and early 2010, and on the A380-800 in late 2010 and early 2011. It is a dedicated cabin section with a 2-4-2 (2-3-2 on the long haul Airbus fleet and 3-3-3 for Alize on the 777-300 serving Indian Ocean and Caribbean routes) configuration with 38″ pitch (36″ for long haul Alize seats), 123° reclining fixed shell seats, including an adjustable headrest, a 10.4″ touchscreen, personal reading lamp, universal power ports, and an adjustable leg rest (40% more space, compared to Voyageur seats; the seats are 20% wider and offer 20% more legroom). There are 38 seats on the Airbus A380, 32 on the Boeing 777-300ER, 24 on the Boeing 777-200 and 21 on the Airbus A340-300 & A330-200 (between the Business and Economy cabin; behind Business on the A380 upper deck). Passengers receive double baggage allowance, priority airport services, lounge access (for a fee), and extra frequent flier mileage. On board, business class amenities include Sennheiser noise-cancelling headphones, an amenity kit (featuring socks, eye mask, toothbrush & toothpaste, and earplugs), improved blankets, and an enhanced meal service with second hot meal, candies, and ice-cream all served with real glass and metal cutlery. A new improved Premium Economy seat using the same shell was introduced from June 2014 on the Boeing 777 aircraft, featuring better cushioning and improved foot rest, adding comfort to the passenger. Economy, Air France's economy class long haul product, features seats that recline up to 118°. The current long-haul Economy seat, which debuted on the Boeing 777-300ER, includes winged headrests, a personal telephone, and a touchscreen TV monitor with AVOD Interactive Entertainment System which have been installed on all of Air France's long haul fleet. On long haul flights, a menu is presented with a choice of two meals. Short and medium haul Economy services are operated by Airbus A320 family aircraft with different seating arrangements. Air France is one of the few airlines who features winged headrests on short to medium haul aircraft in both classes. On short haul flights a snack is served, while on medium haul flights a three course cold meal is served. Free alcoholic beverages are available on all flights, including champagne. On most aircraft, Air France offers extra legroom seats in economy called Seat Plus. These seats are located in the economy class exit rows and other rows depending on the plane, as well as the economy seats on the 747's upper deck, offering at least 4" more seat pitch(36" versus the usual 32" in standard economy seats), the 747's Seat Plus section also provides an extra half-inch of seat width. Seat Plus prices vary by flight time, but it is free to elites and passengers with a full fare economy ticket. Air France has introduced a brand new economy long haul product which features a new slimline seat providing up to an inch more legroom, wider table, universal electrical sockets, retractable armrests, winged leather headrests, more storage space, high definition 10-inch screens featuring the latest in flight entertainment with a USB port, a headphones holder, and newly designed pillows featuring different patterns of the Air France logo. The seats would be installed along with the new La Première, Business, and Premium Economy seats from June 2014 till summer 2016 on the Boeing 777 aircraft, the core of the fleet. All other aircraft would be retrofitted except the Airbus A340-300s and Boeing 747-400s as they would be leaving the fleet soon. For La Première, Air France's first class menu is designed by Guy Martin, chef of Le Grand Vefour, a Michelin three-star restaurant in Paris. Menu items include hors d'oeuvres, entrées, bread basket, and cheeses, along with a dessert cart including pastries, petit fours, and tartlets. On long-haul flights, Air France also serves complimentary champagne to passengers in all classes. Air France offers Audio Video on Demand (AVOD) in all cabins on all long haul aircraft. The in flight entertainment system features multiple channels of video, audio, music, and games. Air France Magazine, the airline's in-flight publication, is included at each seat, and Air France Madame, a fashion luxury magazine with a feminine perspective, is included in La Première and Business cabins and lounges. On all flights, all films may be watched in English, Spanish, and French. Selected films on all flights are also available in Chinese, Japanese, Hindi, and Korean. The airline offers Berlitz International language courses via the in-flight entertainment system. On 29 May 2013, KLM and Air France launched a pilot to test inflight Wi-Fi. Both airlines have equipped one Boeing 777-300ER of each of their fleets with Wi-Fi. Using the inflight Wi-Fi, passengers can stay online using their Wi-Fi enabled smartphones, laptops, or tablets. Wireless service would commence once the flight has reached 20,000 feet. Air France lounges are known as Le Salon, and are open to La Première, Business, and Premium Economy passengers, as well as Flying Blue Gold, Flying Blue Platinum, SkyTeam Elite and Elite Plus members. Worldwide, there are 530 Air France and Skyteam lounges in 300 international airports on every continent except Antarctica. Flying Blue, the frequent flyer program of Air France-KLM, awards members points based on miles travelled and class of service. Membership into the program is free. The program is divided into standard (Ivory), Elite (Silver) and Elite Plus (Gold and Platinum) statuses. Ivory is the basic level which is attained upon entry into the program. Elite status is attained by accruing a certain number of miles within one calendar year. Elite Silver, Elite Plus Gold, and Elite Plus Platinum cards have added benefits. An invitation-only card called Club 2000 is attributed to some VIPs, celebrities and politicians. Officially, it provides the same benefits as Platinum status but numerous sources confirm it almost guarantees upgrade to Business or La Première. Flying Blue succeeded Air France's previous frequent flyer program, Fréquence Plus, which operated until the Air France-KLM merger in 2003. Air France is the official airline of the Cannes Film Festival. Air France "flight 273" is the plane that "Chat Noir" in "Magic Kaito 1412" episode 18: Golden Eye (Part 2): Kid vs Chat Noir Showdown, uses to escape. ^ JO 7340.2H Bsc w Chg 1-3 (Report). Federal Aviation Administration. 2019-02-28. p. 3-2-7. Retrieved 2019-03-03. ^ "Air France names Anne Rigail as new head of airline". Reuters. 12 December 2018. Retrieved 13 December 2018. ^ Salpukas, Agis (27 December 1992). "Air France's Big Challenge". The New York Times. Archived from the original on 18 June 2009. Retrieved 31 May 2009. ^ "Air France – Company Overview". Hoover's. 2009. Archived from the original on 27 April 2009. Retrieved 31 May 2009. ^ "For Air France: The Potez 62: Cruising Speed of 175 mph with Fourteen Passengers". Flight, 21 March 1935, p. 304. ^ "Ordonnance n°45-1403 du 26 juin 1945 portant nationalisation des transports aériens" (in French). Legifrance.gouv.fr. Archived from the original on 5 June 2011. Retrieved 31 May 2011. ^ "Air France: History". Air France. Archived from the original on 5 June 2011. Retrieved 31 May 2011. ^ a b c d e f g h i j k l m n o "Air France (Airline, France)". Fotw.net. Archived from the original on 29 June 2011. Retrieved 31 May 2011. ^ a b c "The Changing Nature of French Dirigisme" (PDF). Archived (PDF) from the original on 6 June 2011. Retrieved 31 May 2011. ^ "Airliner Classic: Airbus A300 – the beginning for a giant: key.Aero, Commercial Aviation". Key.aero. Archived from the original on 28 April 2011. Retrieved 31 May 2011. ^ "Decades of safe flying come to an end". The Birmingham Post. Questia Online Library. 26 July 2000. Retrieved 31 May 2011. ^ Richard Aplin; Joseph Montchamp (1 April 1999). A dictionary of contemporary France. Taylor & Francis. p. 453. ISBN 978-1-57958-115-2. Retrieved 4 August 2010. ^ Rahn, Kim. "Air France Celebrates 25th Years in Korea." The Korea Times. 25 September 2008. Retrieved on 29 June 2010. ^ "France - The Role of Competition Policy in Regulatory Reform" (PDF). Organisation for Economic Co-operation and Development. 2003. ^ "COMPETITION LAW AND POLICY IN FRANCE" (PDF). Organisation for Economic Co-operation and Development. 1998. ^ "FRANCE FROWNS ON COMPETITION". www.joc.com. Retrieved 2017-12-23. ^ "Chargeurs International". Answers.com. Archived from the original on 28 June 2011. Retrieved 31 May 2011. ^ "Amadeus History - 1987 - Amadeus is born!". Amadeus. Amadeus.com. Retrieved 30 November 2017. ^ "Evènements aéronautiques de l'année 1988". Aeroweb-fr.net. Retrieved 31 May 2011. ^ "Pilot who found the right trajectory". Financial Times. 30 September 2007. Archived from the original on 9 June 2011. Retrieved 31 May 2011. ^ Leonhardt, David (31 August 1994). "Air France's New Adviser". The New York Times. Archived from the original on 10 May 2013. Retrieved 31 May 2011. ^ a b c d "Directory: World Airlines". Flight International. 27 March 2007. pp. 56–57. ^ "AIR FRANCE – KLM Company Profile". Yahoo! Finance. Archived from the original on 28 August 2007. Retrieved 31 May 2011. ^ a b "Air France and Delta target London". Financial Times. 17 October 2007. Archived from the original on 10 May 2008. Retrieved 31 May 2011. ^ "Air France And Delta Set Transatlantic Venture". Airwise. 17 October 2007. Archived from the original on 16 May 2011. Retrieved 31 May 2011. ^ Engle, Jane. "Air France will refund or reroute LAX-Heathrow fliers". Los Angeles Times. Retrieved 9 May 2009. ^ "ActionAir - Decembre 2013" (PDF). December 2013. ^ "Transform 2015: progress report at Air France" (PDF). October 4, 2013. ^ "Air France-KLM: over half way through 'Transform 2015' plan, "additional measures" are still needed". CAPA - Centre for Aviation. Retrieved 2017-12-23. ^ "Air France to cut 5,000 jobs by the end of 2013". BBC. 21 June 2012. ^ "AIR FRANCE-KLM : les pilotes approuvent le plan Transform 2015" (in French). Capital.fr. 26 February 2014. Archived from the original on 5 March 2014. Retrieved 2 March 2014. ^ N. Tchallabes (25 July 2012). "New chance for the successor of Air Afrique, Air Cemac". Volaspheric.blogspot.de. Retrieved 2 March 2014. ^ a b "Air France unveils new economy and premium economy". Business Traveller. Retrieved 2 March 2014. ^ Clark, Nicola (31 October 2013). "Air France-KLM Writes Off Alitalia Stake" – via NYTimes.com. ^ "CityJet's disposal by Air France-KLM is under way, but what will happen after the Intro? | CAPA". Centre for Aviation. Retrieved 2 March 2014. ^ Lazare, Lewis (3 December 2014). "PETA targeting Air France to stop shipping monkeys through O'Hare". Chicago Business Journal. Retrieved 29 January 2015. ^ "Air France slammed for transporting lab monkeys". The Local FR. 22 October 2013. Retrieved 29 January 2015. ^ Meikle, James (20 May 2014). "Jane Goodall and Peter Gabriel urge Air France to stop ferrying lab monkeys". The Guardian. Retrieved 29 January 2015. ^ Tidy, Joe (5 May 2014). "Animal Testing Campaign Causing Industry Crisis". Sky News. Retrieved 29 January 2015. ^ Rothman, Andrea (4 February 2014). "Air France Installs Business-Class Beds to Match Rivals". Bloomberg. Retrieved 2 March 2014. ^ "Air France to reap 339 million euros in cash from Amadeus shares" (Press release). Reuters. 10 September 2014. ^ "Air France to cut 2,900 jobs reports say". 2 October 2015 – via www.bbc.com. ^ "Air France". Air France. Retrieved 10 January 2017. ^ Editorial, Reuters. "British Airways, Air France halting flights to Iran from next month". U.S. Retrieved 2018-08-24. ^ "Head Office" Archived 10 February 2010 at the Wayback Machine, Air France. Retrieved on 9 February 2010. ^ "Plan interactif." Tremblay-en-France. Retrieved on 20 September 2009. ^ a b "AIR FRANCE HEAD QUARTERS – Roissypôle." Groupement d'Etudes et de Méthodes d'Ordonnancement (GEMO). Retrieved on 20 September 2009. ^ "Air France Archived 23 August 2009 at the Wayback Machine." Tremblay-en-France. Retrieved on 20 September 2009. ^ "Roissy Charles-de-Gaulle." Tremblay-en-France. Retrieved on 20 September 2009. "Roissypôle réunit dans un cadre architectural moderne des infrastructures indispensables aux entreprises pour lesquelles le contact avec l'international est une necessité quotidienne. La cité d'affaires desservie par le RER accueille le siège social d'Air-France, le Hilton aisni que les bureaux du Continental square et du dôme." ^ Hylton, Wil S. (4 May 2011). 5 "What Happened to Air France Flight 447?". The New York Times. Retrieved on 5 May 2011. ^ "Le futur siège d'Air France devrait coûter près de 700 millions[permanent dead link]." Les Échos. 27 March 1992. Page 12. Retrieved on 23 February 2010. ^ "Air France au bord des pistes." Le Journal du Net. Retrieved on 7 July 2010. "Depuis la fenêtre de son bureau, Jean-Cyril Spinetta peut voir les avions de sa compagnie décoller et attérir." ^ "The Air France Operations Control Centre (OCC) Archived 13 June 2011 at the Wayback Machine." Air France. 9 September 2009. Retrieved on 10 April 2011. ^ "Fonctionnement du CCO Archived 6 July 2011 at the Wayback Machine." Air France. 9 September 2009. Retrieved on 10 April 2011. ^ Mlekuz, Nathalie. "Air France vole vers ses avions, destination Roissy." Le Monde. 2 April 1997. Retrieved on 22 September 2009. "Situé pendant plus de trente ans dans une des tours au-dessus de la gare Montparnasse, le siège d'Air France se trouve désormais près de l'aéroport de Roissy." ^ "Deux offres pour l'achat du siège d'Air France[permanent dead link]." Les Échos. 25 September 1991. Page 12. Retrieved on 26 November 2009. ^ "Air France toujours à la recherche de capitaux frais[permanent dead link]." Les Échos. 20 January 1992. Page 12. Retrieved on 23 December 2009. "Air France a pu boucler son exercice 1991 en incorporant la dotation en capital de 2 milliards de francs consentie par l'Etat-actionnaire, 1,25 milliard apportés par la BNP contre des obligations remboursables en actions (ORA), ainsi que le produit de la vente de son siège à la MGEN (1,6 milliard)." ^ Chenay, Christophe de. "Une ville pousse entre les pistes de Roissy Il ne manquera que des logements pour faire de Roissypôle une véritable cité Mais le projet inquiète les communes environnantes." Le Monde. 13 September 1992. Retrieved on 20 January 2010. "Le transfert du siège d'Air France qui quittera le quartier Montparnasse en 1995 pour Roissypôle devrait donner une légitimité aux ambitions immobilières." ^ "Roissypôle ouvre ses portes[permanent dead link]." Les Échos. 1 October 1992. Page 23. Retrieved on 20 January 2010. "Et le goupe Air France va y installer son nouveau siège social sur 50.000 mètres carrés en 1995." ^ "Air France à Roissy: le décollage du siège social[permanent dead link]." Les Échos. 1 June 1995. Page 32. Retrieved on 22 September 2009. "au terme d'un transfert rigoureusement planifié par la vente de l'ancien siège de Montparnasse." ^ "Rapport final de la commission d'enquête sur l'accident survenu 29 août 1960 au large de Dakar." (Archive) Bureau d'Enquêtes et d'Analyses pour la Sécurité de l'Aviation Civile. 10 September 1963. p. 575. Retrieved on 28 January 2013. "Propriétaire : compagnie nationale Air France, 2, rue Marbeuf, à Paris (8e)"
^ "Air France in the United States Archived 6 January 2011 at the Wayback Machine." Air France. 11 June 2007. 15 (15/16). Retrieved on 13 February 2010. "The Air France "United States" regional management is located in New York: 125 West 55th Street, New York, NY 10019 Tel: (212) 830–4000." ^ "Air France leases 29,500 sf at Avenue of the Americas Plaza Archived 19 January 2012 at the Wayback Machine." Real Estate Weekly. 10 July 1991. Retrieved on 24 February 2011. ^ Valode & Pistre – Projects -> Thematic -> Office -> Air France Cité PN Archived 17 July 2011 at the Wayback Machine (in English). Valode & Pistre. Retrieved on 28 June 2010. ^ "Nous Situer." Air France Vaccinations Centre. Retrieved on 5 May 2010. ^ "Vaccinations Centre Archived 6 May 2010 at the Wayback Machine." Air France. Retrieved on 5 May 2010. ^ "La protection au quotidien." Air France Vaccinations Centre. Retrieved on 5 May 2010. ^ a b B. H. "Twingo travaillaient à la chaîne La station Simplon ne rouvrira qu'en novembre Le centre de vaccinations d'Air France déménage." Le Parisien. 10 August 2005. Retrieved on 5 May 2010. "Le centre de vaccinations internationales d'Air France quittera samedi le terminal de la compagnie aux Invalides (VII e ) pour emménager à deux pas, au... 148, rue de l'Université (Paris VII e )." ^ "Agences Air France Paris." Air France. Retrieved on 22 June 2010. ^ "Contact Us." Air France Museum. Retrieved on 22 June 2010. ^ "1959–2009 The 50th anniversary of the Air France ticket agency at Les Invalides Archived 28 July 2011 at the Wayback Machine." Air France. Thursday 27 August 2009. Retrieved on 22 June 2010. ^ "Subsidiaries covering the needs of the markets Archived 4 July 2010 at the Wayback Machine." Air France. Retrieved on 21 June 2010. ^ "ISO Album" (PDF). quali-audit.aero. Archived from the original (PDF) on 23 June 2010. Retrieved 21 June 2010. ^ "Subscribe to read". Financial Times. Retrieved 2019-01-11. ^ "Air France's new livery retains much of current scheme". Flight International. Archived from the original on 12 February 2009. Retrieved 11 February 2009. ^ ""Air France Music" takes off" (Press release). Air France. 16 March 2010. Archived from the original on 4 December 2010. Retrieved 3 August 2010. ^ "Air France Bring A Bit of Parisian Flair To Our Screens". The Design Air. Retrieved 2 July 2015. ^ "Air France presents new uniforms designed by Lacroix". USA Today. 4 April 2005. Retrieved 3 August 2010. ^ "AVIATION: Pegasus a la Francaise". Time. 23 January 1956. Archived from the original on 9 July 2010. Retrieved 3 August 2010. ^ "Air France's Hippocampe and BOAC's Speedbird: the semiotic status of logos". French Cultural Studies. Archived from the original on 22 January 2016. ^ "Profile on Air France". CAPA. Centre for Aviation. Archived from the original on 30 October 2016. Retrieved 30 October 2016. ^ "Air France-KLM Signs Codeshare Agreement with Singapore Airlines and SilkAir". Air France KLM. 13 April 2017. ^ "Singapore Airlines And SilkAir Sign Codeshare Agreement With Air France-KLM". www.singaporeair.com. Archived from the original on 2018-12-09. ^ a b "AIR FRANCE UNVEILS ITS NEW LONG-HAUL TRAVEL CABINS AVAILABLE ON BOARD AIRBUS A330". ^ AIN Online (28 August 2018). "KLM Delays First A350 Deliveries to 2021". Retrieved 9 October 2018. ^ "Exclusivité : Les aménagements intérieurs des Airbus A330 et A350 d'Air France ! - The Travelers Club". The Travelers Club (in French). 2017-05-31. Retrieved 2018-05-21. ^ Gubisch, Michael (6 January 2017). "KLM to introduce A350 in 2020". flightglobal.com. London, UK: Flight Global. Retrieved 30 September 2017. ^ "Air France KLM announces the order of 110 Airbus A350 and Boeing 787 aircraft" (PDF) (Press release). Air France-KLM. 16 September 2011. ^ 2016, UBM (UK) Ltd. "Air France plans 787-9 debut in Jan 2017". Retrieved 1 October 2016. ^ "ASIATravelTips.com, 18 June 2001 – Air France confirms major A380 order". Sydney Morning Herald. Asiatraveltips.com. 18 June 2001. Archived from the original on 27 May 2011. Retrieved 31 May 2011. ^ a b Jens Flottau (20 April 2017). "Air France Anticipates 2018 Narrowbody Aircraft Decision". Aviation Daily. Aviation Week. ^ "Air France historic fleet at airfleets.ner. Retrieved 20 November 2009". Airfleets.net. Retrieved 31 May 2011. ^ a b "Photo ref B707". Airliners.net. 1 April 1969. Retrieved 31 May 2011. ^ "Orders and Deliveries: Boeing 747." The Boeing Company. Retrieved: March 1, 2018. ^ "Air France retires 747". Archived from the original on 15 January 2016. Retrieved 14 January 2016. ^ "Air France Accelerates Boeing 747 Retirement Schedule". Routes. Retrieved 10 October 2016. ^ "Air France – Corporate : Livraison du nouveau Boeing 777 à Air France" (PDF). Air France. Archived from the original (PDF) on 14 November 2011. Retrieved 3 May 2011. ^ "La Première – First Class – Comfort – Air France airline". Airfrance.co.uk. Retrieved 2 March 2014. ^ "Air France unveils its new Business class seat: a cocoon in the sky : Air France – Corporate". Corporate.airfrance.com. 4 February 2014. Archived from the original on 1 March 2014. Retrieved 2 March 2014. ^ "Air France Premium Comfort". Airfrance.us. Archived from the original on 28 February 2014. Retrieved 2 March 2014. ^ "Economy Europe". AirFrance. Retrieved 2017-12-23. ^ "Economy - intercontinental Caribbean/Indian ocean - At the airport". AirFrance. Retrieved 2017-12-23. ^ "The new Economy seat, optimum comfort for all : Air France – Corporate". Corporate.airfrance.com. 25 September 2013. Archived from the original on 22 February 2014. Retrieved 2 March 2014. ^ "Forbes – First-Class Chefs Take Flight". Forbes. 26 October 2006. Retrieved 31 May 2011. ^ Heger, Monica (6 November 2008). "There is such thing as a good airline meal". MSNBC. Retrieved 31 May 2011. ^ "Source ? Seems incorrect". ^ Ryan Rager. "Air France Madame". Echo-media.com. Retrieved 31 May 2011. ^ "Air France KLM in Asia Pacific Archived 6 January 2011 at the Wayback Machine." Air France-KLM. 27. Retrieved on 27 June 2010. ^ "Air France and KLM launch inflight Wi-Fi" (Press release). KLM. 29 May 2013. Retrieved 12 July 2013. ^ "lounges at the airport, conditions for admission to lounges". Air France. Retrieved 2 March 2014. ^ "Les cartes dont raffolent les grands dirigeants : Club 2000 d'Air France" (in French). Journaldunet.com. Retrieved 2 March 2014. ^ "Vols intercontinentaux, Choix des sièges et surclassement .. : Le café des hôtesses de l'air et stewards". Pnc-contact.com. Retrieved 2 March 2014. ^ "Concours de photos d'avions, du 15 mai au 15 août 2009". Roissy, France: Air France. 15 May 2009. Archived from the original on 7 July 2011. Retrieved 6 March 2011. ^ "LE COURRIER AIR FRANCE PARTENAIRE DE L'ÎLE-DE-FRANCE JANVIER 2009" (PDF). Air France. 2009. p. 3. Archived from the original (PDF) on 6 July 2011. Retrieved 6 March 2011. ^ "Photo of F-GFKJ". Toulouse, France: Airliners.net. 20 November 2008. Retrieved 6 March 2011. ^ Chroszcz, Paul (February 2011). "Photo of F-GFKJ" (Photo). Barcelona, Spain. Retrieved 6 March 2011.